“We can’t thank the members of our community enough for their support again this year,” began Evan Smith, Chair of the United Way of Union County annual campaign, at last week’s LIVE UNITED Awards held at Union Rural Electric in Marysville. A crowd of over 115 United Way Workplace Champions was saluted for helping to raise over $930,000 for the Union County community. That was 93% of the organization’s $1,000,001 goal for 2016-17. Campaign dollars raised are then allocated to the 26 Partner Agencies to support 40 programs that United Way funds throughout Union County. Almost 14,000 books were mailed to over 1100 pre-school aged children in Union County who are members of the Dolly Parton Imagination Library, instilling a love of reading from an early age and helping to create a home library for each member. With the community’s assistance, almost 25,000 meals were delivered through the Food Pantry Network that includes pantries in Marysville, Milford Center, Plain City and Richwood. This network is overseen by The Salvation Army. Union County’s donations helped 103 community members of the area who are battling cancer and were provided patient assistance by the Union County Cancer Society. Finally, almost 84,000 meals were provided by the Memorial Meals Program for approximately 4,564 residents through the Mobile Meals and Community Meals programs. In addition, donor dollars from this year’s United Way campaign are reaching six area pantries, two shelters, four senior centers, a homeless prevention program, rent and utility assistance, disaster relief, prescription medication, hospice care, cancer patient support, youth activities, and more. In all, 40 programs of 26 Funded Partners are receiving United Way support. 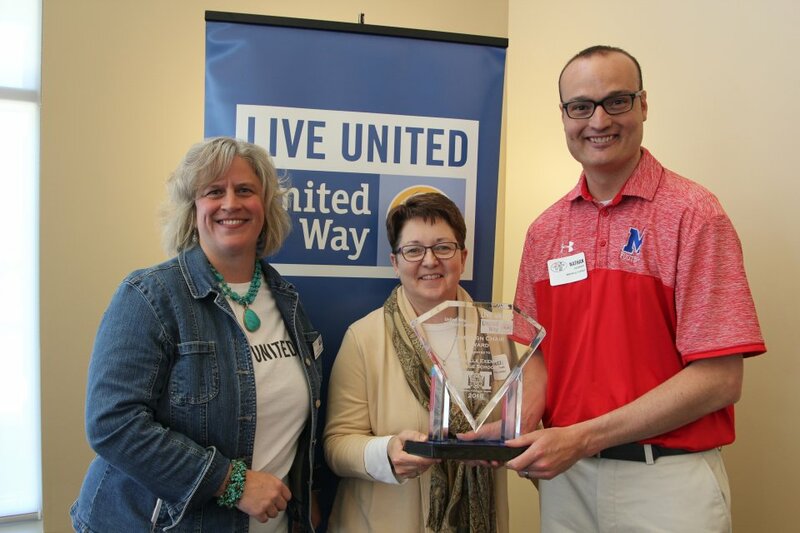 Over 70 businesses were awarded with a 2016 LIVE UNITED Award, once again demonstrating the community’s continual support of United Way and its mission. The 2016 Campaign Chair Award, United Way’s top honor given to the most outstanding workplace, was presented to the Marysville Schools. Marysville Schools were chosen as the entire school district embraces the work done by United Way. In addition, this year the whole school system participated in the 2016 RadioThon in conjunction with QT TRUE OLDIES, with every building collecting change for coin wars to bring in over $4000 from the students and staff. Receiving the award for Marysville Schools were volunteers United Way Board Member Diane Mankins, Nathan Stackhouse and Kristy Rowland. Thirty-four workplaces earned a Gold Campaign Award for giving levels achieved this fall. These workplaces have 40% of their employees giving to United Way, have an average employee gift of $150 or more, or provide a 100% corporate match. These include: Allen Yurasek Merklin & Owens-Ruff; Bob Chapman Ford; City of Marysville; Conrad Leibold Woerner & Company; Conti-Tech; Costco Wholesale; Dayton Power & Light; Fairbanks Schools; Honda of America; Liberty National Bank; Loving Care Hospice; Maryhaven; Marysville Public Library; McCarthy & Cox; Memorial Health; Mental Health & Recovery Board; Moriroku Technology North America; Nationwide; Nestle Product Technology Center; Parker; Richwood Bank; Scotts Miracle-Gro; Select Sires; Sumitomo Electric Wiring Systems; TECHnology Site Planners; Tolles Career & Technical Center; Union County Board of Developmental Disabilities; Union County Chamber of Commerce & Visitor’s Bureau; Union County Commissioner’s Office; Union County Department of Job & Family Services; Union County Family YMCA; Union County Health Department; Union County Prosecutor’s Office; and Union Rural Electric. Three workplaces earned a Silver Campaign Award for having 30% participation or an average employee gift of $100. These include: Jonathan Alder Schools; the Union County Engineer’s Department and the Union County Sheriff’s Office. Bridges Community Action Partnership; Honda Lock R&D; Meijer; North Union Local Schools and the Union County Auditor’s Office earned Bronze Campaign Awards for having 20% participation or an average employee gift of $52. Twenty-seven entities earned Good Neighbor Awards for participating with United Way on special projects throughout the year. These include: Adecco; Alan Wilson CPA; Central Ohio Youth Center; Culver’s of Marysville; EGreen Computers; E-Marysville.com; Forum Manufacturing; Honda Accessory America; Honda Federal Credit Union; Interim Health Care; Jerome Village Company; Junior Library Guild; Keller Williams Realty; LeCrone Communications; Lowe’s Home Improvement; Mailings by Brooke; Marysville Moose Family Center; Midwest Express; Parrott Implement; Prestige Gardens; St. John’s Lutheran Church & School; Techknowlogic; The Home Depot; The Marysville Journal-Tribune; True Oldies 1270; Union County Foundation and WalMart. United Way’s annual awards luncheon was celebrated at Union Rural Electric with the corporate support of Alan Wilson CPA; Dayton Power & Light; Interim Health Care; Liberty National Bank; and Union County Foundation, ensuring that no donor dollars were spent on the recognition event. United Way works to bring neighbors and resources together to improve lives in Union County. United Way of Union County has raised more than $20 million for local needs since it was established in 1958. More than just a fundraiser, United Way collaborates with local businesses, government, and non-profit organizations to solve pressing social service issues large and small. For more information, please visit www.unitedwayofunioncounty.org. United Way presents Marysville Schools with the Campaign Chair Award, United Way’s highest distinction of honor, for its workplace campaign achievements during the 2016-17 campaign. Marysville Schools raised almost $24,000 during the annual United Way Campaign for Union County. Pictured from left to right: Robin Coffey, United Way Campaign & Publicity Coordinator, Kristy Rowland and Nathan Stackhouse, Marysville Schools.